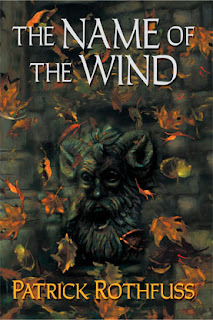 The Name of the Wind is the debut novel by American author Patrick Rothfuss. It is the first volume in The Kingkiller Chronicles and has arrived on the back of an immense amount of publicity, comparable to that which accompanied the release of Scott Lynch's The Lies of Locke Lamora last year. It is also an accomplished book which I greatly enjoyed reading. The Name of the Wind is really two stories told in parallel. In the present-day tale we meet 'Kote', an innocuous barman running a nice inn in the middle of nowhere. However, his ability to single-handedly take on an infestation of spider-like demons soon hints that he is more than he seems. The arrival of 'Chronicler', a man searching for a legend, soon reveals the truth to us: that our flame-haired innkeeper is really Kvothe, a warrior and spellcaster of powerful repute. The bulk of the novel then proceeds in flashback as Kvothe tells his life story to Chronicler. There is nothing particularly new in this story. Kvothe is born amongst a travelling people and lives the bucolic dream until events take an unexpected turn etc. He then grows up learning various skills and eventually becomes an apprentice spellcaster at the great Commonwealth University, where things threaten to go a bit Harry Potter-shaped (although Rothfuss on his first novel is already a far more accomplished writer than Rowling after six) for a few chapters until Rothfuss takes the story in a more compelling direction. What is unusual and somewhat refreshing about the story is its relaxed feel. There are moments of high drama, of confrontations and skirmishes and terror, and Rothfuss handles all of these with the skill of a seasoned writer, but for the most part the story is allowed to unfold at its own pace. Rothfuss' writing is quite rich and draws you into its smokey taverns, its music halls and wild windswept bluffs with ease, a far cry from the furious pace some othe recent fantasy stories have unfolded. In fact, when the novel comes to an end it's a slight surprise that it's not with a bang, but a simple pause before Kvothe unveils the second part of his life story. The reason for this is that The Kingkiller Chronicle is actually one huge single novel that was broken in three for publication, and no attempt has really been made to make the individual parts stand alone. Those used to the 'standalone novel which is simultaneously part of a larger story' approach recently favoured by Scott Lynch or Steven Erikson may find this move slightly frustrating, as the second part of the trilogy is still a year away from publication. Another flaw in the novel is that Rothfuss gives occasional winks to the audience letting them know that he knows about the cliches of the genre, and indeed he does a great job of subverting them on several occasions to good effect. However, on at least one occasion he oversteps this with a post-modern passage about Kvothe noting how his story sounds like a traditional campfire yarn and how his audience shouldn't get too comfortable just yet. Amusing, yes, but it took me out of the story. Not a good move. Despite these minor problems, this is still an excellent fantasy novel, especially for a debut. The writing is very crisp and clear, with rich detail and some vivid characters. Rothfuss has done his homework and the University sections of the novel work very well, with mathmatics, metal-working, chemistry and music all forming part of the story in a very intricate manner. Rothfuss' magic system is also highly accomplished and original in conception and execution. I would recommend this book to anyone who is a fan of Tad Williams, Joe Abercrombie, Scott Lynch or good, solid epic fantasy in general. Rothfuss hasn't necessarily done anything new here, but he's done it with a confidence and ability rare in a first-time novelist. The Name of the Wind (****) is available now in the United States from DAW Publishing. A UK edition (with a frankly superior cover to the US editions) will be available on 20 September 2007 from Gollancz. Pat's Fantasy Hotlist reviews the book here. SFFWorld review the book here. Nethspace has a review here. 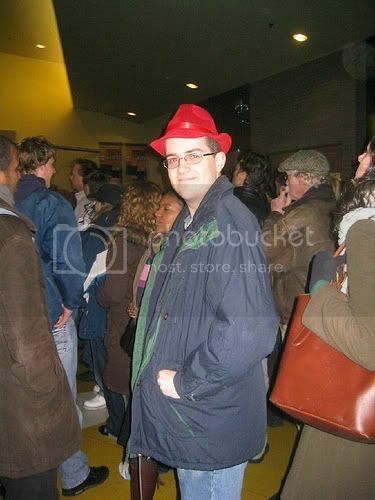 The author has a website here. The author has also taken part in a Q&A session on Dragonmount.com which may be of some interest. It sounds like you felt a lot like I did about the book - the ending bugged me, but is ultimately forgivable. I've been a bit ambivalent to this book. It sounded like... Well, like something I've read before once and wasn't all that keen on rereading. This changed with you nice and informative review. I'm not going to order it right away, but I'll strongly consider picking it up sometime. Thanks. Like I said in the review, it doesn't do anything new, but it is still an excellently-told story with a few nice spins on things (not dissimilar to Lynch or Abercrombie). Do you plan to read the next, wait until the first trilogy is completed or wait until the next trilogy is completed? It does not bode well that the gap between the 1st and 2nd books exceeds that between the 1st and 2nd books in ASOIAF- even tho Rothfuss had already "written" the trilogy (bet he regrets ever having said that). Perhaps as Pat becomes a more experienced writer his pace will increase mitigating the greater time between books that long series generally have.